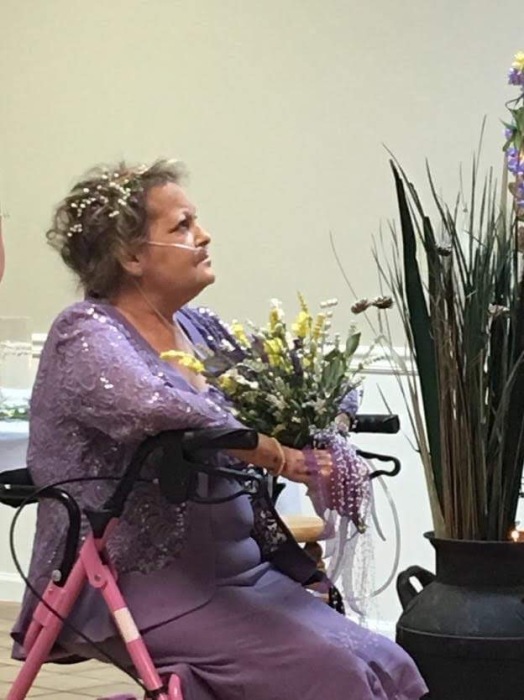 Joy Faye Patterson Summers, 55 of Newbern, Tennessee died on Saturday, October 20, 2018, at her residence in Newbern, Tennessee. Born Sunday, August 25, 1963 in Dyersburg, Tennessee, she was the daughter of the late Joy "Bud" Patterson and the late Monette Permenter Chase. She and her husband were the former owners of City Cafe located in Newbern, Tennessee. Funeral services for Mrs. Summers will be 11:00 AM on Wednesday, October 24, 2018 in the Chapel of Johnson-Williams Funeral Home. Officiating this service will be Rev. James Combs. Interment will follow in Fairview Cemetery in Dyersburg, Tennessee. Visitation will be Tuesday from 5:00 PM until 8:00 PM at Johnson-Williams Funeral Home. She is survived by her husband of twenty-five years, Terry Summers of Newbern, Tennessee; two daughters, Angela Courtney (Kevin) of Leakesville, Mississippi and Jennifer Crittendon (Joe) of Union City, Tennessee; four brothers, Steve Patterson( Naomi) of Dyersburg, Tennessee; Terry Patterson (Susan) of Tatumville, Tennessee: Terry Chase (Amanda) of Millsfield, Tennessee and Michael Chase (Melissa) of Newbern, Tennessee; one sister, Carolyn Cruz (Faron) of Yorkville, Tennessee and seven grandchildren, Summer Sego, Tyler Courtney, Riley Crittendon, Lilly Crittendon, Avery Crittendon, Wade Courtney and Blake Courtney. In addition to her parents she was preceded in death by her step-dad, Terry Dean Chase and her sister, Sandy Patterson. Pallbearers will be Terry Lemons, Anthony "Toe Joe" Lemons, Taylor Chase, Nick Mamula, Mickey Hudson and Faron Cruz. Online condolences may be made to the family at johnsonwilliamsfuneralhome.com. Johnson-Williams Funeral Home is honored to serve the family of Joy Faye Patterson Summers.